Guided mode resonant (GMR) structures consist of grating coupled waveguide that exhibits a sharp resonant reflection peak when the wave vector of the first order wave nearly coincides with the effective waveguide mode wave vector. Considering water as the top dielectric medium (analyte), variations of its index due to pollutants shifts the resonance. 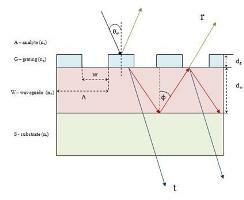 Results and the design procedure to obtain optimum sensor are presented using rigorous electromagnetic simulations and analytical calculation of sensitivity based on the dispersion relation for three and four layer planar waveguides. It is shown that a planar waveguide model gives a good approximation for finding the resonance peak locations and estimating the sensitivity when the grating layer is homogenized to a uniform uniaxial layer. The optimum sensitivity was shown to occur when the evanescent field and its penetration depth in the analyte are maximized, that is the interaction integral is maximized.